Hand creams are one of those things that I like to have on rotation. I've said it many times before on here but I'll find something that works, then after a while it just won't be as effective. So I find using a few different ones tends to keep this from happening. Burt's Bees is a brand I've only ever tried through Glossybox but what I've had from them, I've really liked. When I recently came across a Boots that stocks the range and it was on 3 for 2, I decided it was about time I tried some bits. I just had a hard time deciding what to choose as everything smells so yummy. This however, was something I've wanted to purchase for ages. Soft hands are always appealing. 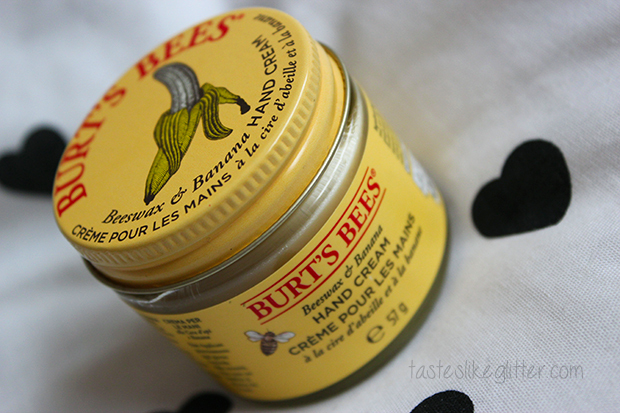 So give them an enticing touch with Burt's Bees' Beeswax & Banana Hand Creme. This super rich, all-natural hand cream is made with aloe vera and vitamin E to moisturise dry skin and beeswax to help seal and shield your hands from the elements. The sweet smell of banana reminds you to feed your skin with nourishing care. This is definitely one of those to keep on your bedside. Not only does it come in a hefty glass jar so isn't great for throwing in your handbag. It's a rich, thick, buttery type cream. I don't find it uncomfortably oily like Lemony Flutter from Lush but it takes a little while for it to sink in completely. The scent is the thing that drew me to it the most. It's not an artificial banana smell at all but it's definitely a nice change from the usual hand cream scents. They also do an almond and milk version of this if banana isn't something you're a fan of. I love slathering this on after pushing back my cuticles and giving my nails a clean and tidy. It keeps them from being dry and looking untidy. Then I finish up with applying a little more all over my hands and giving it time to sink right in, resulting in wonderful smooth hands. It really is the perfect addition to my night time routine.